I love Joseph Campbell and especially that quote. It took me awhile to get it right but somehow I did. Sometimes we are just too close to the action to understand how unhealthy it is for us. This year has been transforming for me. I let go of something, and it felt so good. I feel grounded and understand my goals more clearly than ever before. For me to achieve that, I questioned how I spent my time and energy, and what I enjoyed doing the most in 2015. When I sat and thought it through, there was no question in my mind what I wanted to make happen in the new year. So here it goes. My number one goal for 2016 is devoted to taking the plant-based message to another level. I want to make a positive difference in people lives by encouraging people to be part of a healthy compassionate community. Nothing makes me happier then to see someone kick their food-related disease to the curb with a plant-based diet. I want everyone to know that they don't have to be sick anymore. I want to inspire and empower people to live a long and healthy life. No matter how old you are, how sick you are or how pessimistic you are. We can do it together. I promise. So my next plan of attack is a weekly Ordinary Vegan podcast. My podcast will begin this month and will be available in iTunes and on this website. I will share all things plant-based including the latest health news, recipes, incentives and interviews with leaders of the plant-based revolution. I also want to tell your stories, so please if you changed your health with a plant-based diet, please tell us your story in the comments below or message me. You can be an inspiration to others. Thanks for hearing me out. I know this podcast is going to take a lot of time and energy to get it right, but somehow I will with your support. Now, on to this week's delicious plant-based recipe. 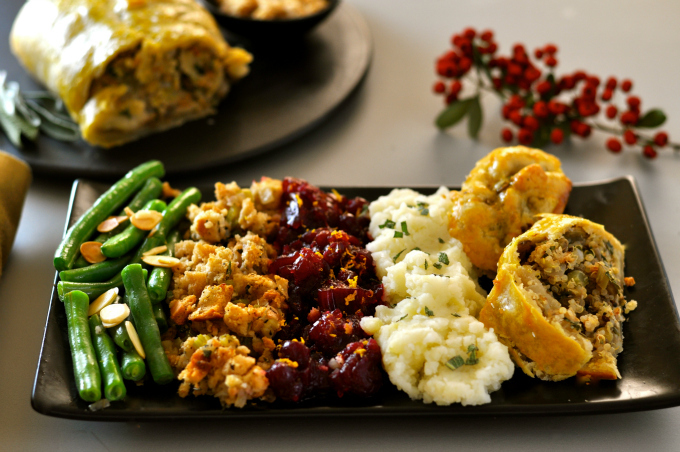 It's that time of year so why not spoil your friends and family with this rich and savory vegan roast wellington stuffed with mushrooms, eggplant, quinoa, and lentils. Yes, this vegan loaf is a lot of work but the results were delicious and impressive. The step by step directions are in the recipe below but if you are still confused about rolling the pastry into the cylinder shape, I highly recommend watching my video on assembling this vegan Wellington HERE. Often visuals are so much better than words. Also, speaking of pastry dough, I couldn't find a frozen vegan pastry dough, but I did find a frozen vegan pie crust. That worked just fine, or you can make a home-made pastry dough with vegan butter. Make sure it is at least 1/4 inch thick or a little more to hold the ingredients. Hope you enjoy this vegan roast as much as I did. Don't miss any of Ordinary Vegan's free recipes by signing up here. If you would like to learn more about a vegan diet – listen to my weekly podcast. Hope you enjoy this vegan roast wellington as much as we did. Thanks and Happy Holidays everyone!! Don't worry about your eggplant slices looking pretty just try to make them thin and all the same size. I like to use my hands to pat down the mushroom mixture. 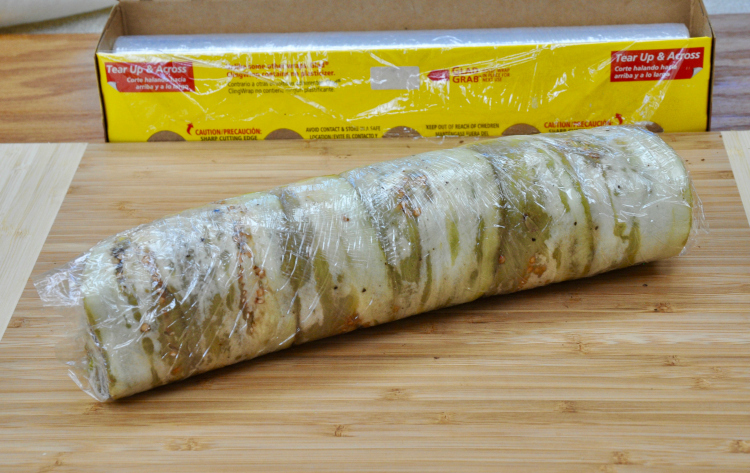 Lay the loaf mixture on top and form into a cylinder and roll the plastic wrap slowly, tightly and carefully. Twist the ends. Place the cylinder in the refrigerator for at least 15 minutes to firm up. 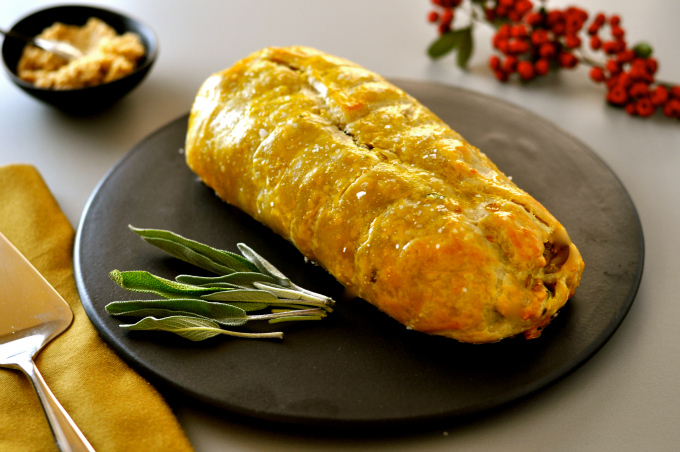 A vegan wellington recipe that is a labor of love but well worth it for special evening or holiday meal. Place the garlic, mushrooms and walnuts in a food processor. Pulse until finely chopped. Add the chopped chestnuts and thyme. Cook in a dry hot pan to intensify the flavors and remove the water from the mushrooms. This will take about 7-10 minutes. When all the water has been fried off, remove and refrigerate until assembly. Heat vegetable broth over medium-heat in a large non-stick saute pan. Add onions and clery and cook until soft and translucent. Add garlic, thyme, sage, basil, oregano and saute another minute or two. Add a little more vegetable broth if the vegetables are sticking. Remove from heat. Meanwhile, make flax eggs by whisking together 2 tablespoons of ground flax seed with 5 tablespoons of water. Put in refrigerator for 10 minutes or more to thicken. In a large bowl mash the lentils. Add the quinoa and combine. Add the onion mixture, bread crumbs, parsley, salt, pepper, flax egg mixture, dijon mustard and apple cider. Combine. Add more bread crumbs if needed to hold the loaf together. Taste for seasonings. Add more herbs or salt and pepper if needed. Set aside. Peel the eggplant. Cut off the stem and slice a small piece off the base giving you a stable ground so it can stand upright. Using a very sharp knife, slice down lengthwise into long thin slices from the top to the bottom. As thin as possible. Place on a plate. Season with salt and pepper and lightly brush with olive oil. Set aside. Now start assembling the wellington. 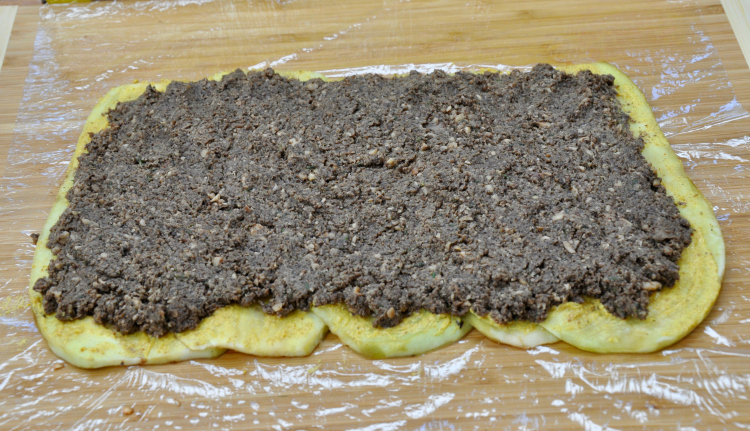 In the middle of a large piece of plastic wrap, lay and overlap the eggplant slices diagonally. Leave about an inch of space between the ends of plastic wrap or measure depending on size of pastry dough. Spread the mushroom filling evenly and thinly over the eggplant, a half inch from the ends. Brush the mushroom filling with a little spicy brown mustard. Next lay the loaf mixture over the mushroom and eggplant and form into a loaf / cylinder. Very carefully, fold the front of the wrap over the mixture and begin to carefully roll like you are forming a tight burrito. Twist the ends. Place in the cylinder in the refrigerator for 15 minutes to firm up. Roll out you thawed pie dough a couple of rolls with the rolling pin. 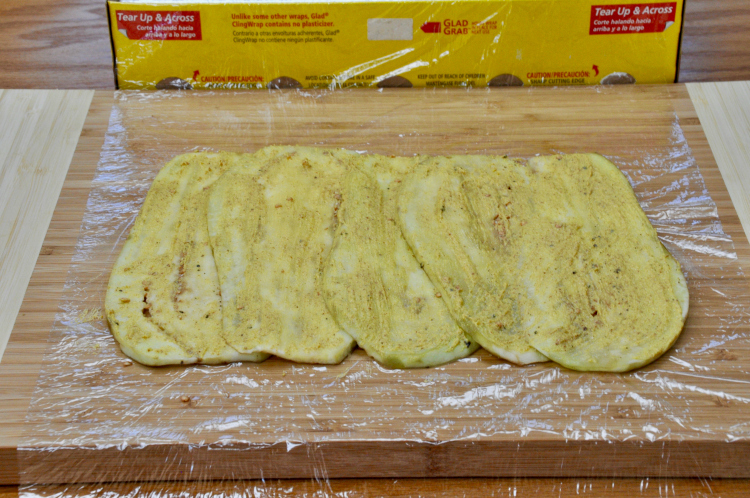 Lay the dough on a large piece of plastic wrap. Remove the wrap carefully from the cylinder. Lay the cylinder in the middle of the dough and carefully roll the dough tightly until the two ends meet over the cylinder.Trim off any excess pastry dough. Twist the ends together to ensure the lentil mixture is completely sealed into the pastry. Now to set it perfectly, roll the plastic wrap over the cylinder and roll it tight into a burrito shape, twisting the ends. Place in refrigerator for 15 minutes or overnight. Remove the cylinder from the refrigerator. Carefully remove the plastic wrap. Combine the butter and oil and brush lightly over the entire cylinder. Place on a baking sheet into the 350 degree oven for 25-30 minutes or until golden brown. Let it rest for 15 minutes before cutting. Mine did not come out long and thin. Short and fat! I’ll bake it anyway and take my chances! Hi Barbara – Mine comes out short and fat sometimes too! It is not about the size – it is about the favors! Hope you enjoy it – happy holidays! Okay, I’m going to give it a whirl for Thanksgiving dinner. Wish me luck! I will also be attempting to make it gluten free. Good luck Lisa – I know this takes some work but it is very impressive and delicious. Happy Holidays! I love vegetable Wellington. I make a roasted vegetable version that my family loves. This looks great, and the addition of chestnuts is fantastic! Looks like you put a lot of work into this recipe! Sounds delish! Woah, this most be a flavour fest with every mouthful just looking at the ingredients! Vegan food is definitely everything but boring! This was yummy but the assembly directions were confusing. Also would help to have some dimensions in inches. My eggplant wasn’t big enough. Pictures would have helped for the step by step assembly. Mine fell apart in the oven so it dried out. (Didn’t chill enough, my fault). I had a bunch of filling left over. Would be great with a yummy onion gravy! Hello. Yes, just reading this I did not understand the egg plant instructions. Can you explain please what “lay and overlap eggplant diagonally” means before I try this for Christmas?” Or pictures would be great!! Hi Becca – I will email you some photos from one I just made. Happy Holidays and thanks for reaching out! Hi there I am making this for Christmas and confused about the oeggplant and wrapping also! Would you be sable to email me also? Hi Stephanie -Just sent you an email with some photos – Happy Holidays! Well, it’s in the refrigerator. Soon will be in the oven. Took a little over 3 hours with prep and assembly. Interesting adventure with this. I hope it turns out. If not, a pizza will take its place. Happy New Year Nancie – I know it will be delicious! Thanks for being part of our community! Is there a suitable substitute for chestnuts? Just cannot find them where I live. Hi Nancy – Chestnuts are hard to replace since they have an earthy, creamy flavor. You may be able to buy them online and some markets like Trader Joes and even Costco has carried them pre-roasted and peeled especially around the holidays. I would just leave them out altogether instead of trying to substitute. Hope that helps. Thanks for being part of our healthy community! This looks fantastic…except my husband will not touch eggplant with a 10 foot pole. What do you think might be a good substitute? Any ideas? Thank you so much for your recipes, thoughts and generous sharing! Hi Jeramie – I would recommend zucchini or a mild squash in place of the eggplant – Hope you love it and thanks for the kind words! That whole plate looks delicious! Are there recipes for the side dishes on your website as well? Here is a link to some more holiday recipes including the stuffing. Thanks for being part of our healthy community! This looks lovely! Not a huge fan of eggplant so will try yellow squash instead 🙂 Do you think that once it is chilling in the refrigerator that it could stay there overnight and assemble it the next day for cooking? Absolutely Tina – as a matter of fact, that is what I would recommend. It is so labor intensive and the final steps on the holiday make much more sense. Thanks for reaching out and thanks for being part of our healthy community! Hi! Do you have a substitute recommendation for eggplant? I am not a huge eggplant fan, but this recipe looks amazing! Thanks in advance:). Hi Kim – I would recommend perhaps some butternut squash thinly sliced or don’t use anything in place of the eggplant. Thanks for stopping by and for being part of our healthy community! It all sounded lovely until the vegan butter and oil. What could I sub instead? Would broth work? We don’t use oils of any kind. Hi Jackie – absolutely! Thanks for stopping by and thanks for being part of our healthy community. Hi Alexandra – You can just drag the photos from the website posting on to your desktop. Just click on it – stay clicked and drag. Let me know if you have a problem. Thanks for stopping by and happy holidays! I came across a plant based diet by accident. I had an operation in 2016 that altered my enzymes. Basically, a plant- based diet was the only thing left for me. OMG. Why didn’t Antony tell me about this before. When I was 40 I felt 60. Now I’m 50 and I feel 30. Everything is light and I feel like I’m floating through life. With recipes like yours, I don’t feel like I’m missing anything. From a former carnivore, why does the world feel it necessary to kill anything. Even my Irish, meat and potatoes husband is starting to change his mind. PS, in one year I have list 75 pounds without even trying. Goid food and exercise is amazing. So is caring about more things than just yourself. Thank you for sharing your culinary skills with us! You are truly an amazing cook. ps May I share your journey with others? Can i use puff pastry for this? Hi Karen – I have never used puff pastry but I suppose you could. I would just worry about it being strong enough for the loaf. You could make make mini pockets with the loaf mixture into the puff pastry minus the eggplant. That would probably work well and be less labor intensive. Thanks for stopping by and thank for being part of our healthy community! Hi, this looks amazing! I am going to make this for Christmas dinner but would like to use puff pastry instead of pastry crust. Would this work? Thanks, I asked a second time by mistake! I was wondering about how strong it would be since it is a little flimsy to work with. I’ll give it some thought. I’m not a very good pastry-maker! Hi Kathy – I have never made it with puff pastry and I am afraid it wouldn’t hold up unless you made individual little puff pastry pockets with the filling minus the eggplant. I hope that helps. Thanks Kathy and happy holidays! I’m planning to do exactly that for a New Year feast – mini puff pastry wellington pockets! Hi Nicole – I have never frozen it ahead but I don’t see why not. What I have done is all the assembly the day before Thanksgiving just not the baking which helps with time management. No doubt about it, it is time consuming but impressive. Thanks for stopping by and for being part of our healthy community! Hi Jody – Yes but this video should help – I will warn you, it is very labor intensive but impressive! thanks for stopping by and for being part of our healthy community! I’m looking to make this for Thanksgiving this year, but am not a fan of quinoa. Do you think couscous would work in it’s place? Hi Shelly – I don’t cook couscous very often so I am not sure of the texture but I would imagine it could work – barley or brown rice could also make a good substitute. This is very labor intensive and I hope you enjoy it. Make sure you make lots of vegan gravy to serve with it. Happy Holidays! Hi Bridgette – Thanks for the feedback – I love the puff pastry also and I love that those non-vegans wanted to gobble it up. Thanks for being part of our healthy community and wishing you a wonderful Thanksgiving! I made it today for Thanksgiving. My husband and I have been plant based for about a year and a half. You aren’t kidding, a labor of love, but OMG it was delicious, healthy and nutritious! Thank you so much for sharing this, we’ll be enjoying for a few more days. (Lots of leftovers).